Rarotonga has one of the last pristine native-forests in Polynesia. The ancient Polynesian settlers removed the forest on the lower hills and as these became infertile they developed into the Fernlands. After European Contact, especially after 1823, many new plants were introduced and some of these were planted in the mountains, especially cotton, coffee, and bananas. A Disturbed Forest of Tree Hibiscus (‘Au) and invasive shrubs now cover these areas. Inland of the Fernland and the Disturbed Forest there remains a near-pristine native forest, protected from people by being too steep for horticulture and by the absence of trees suitable for timber. The native forest is green except for the few white-leaved Candlenut Trees (Tuitui), which are conspicuous from afar. However, in recent weeks many inland trees have turned pink and then cream. These colours are caused by the profusion of pink buds and then cream-coloured flowers on Cook Islands Homalium (Mato), which were damaged in the February cyclones. The Cook Islands Homalium (Mato) is the most common tree in the native forests of inland Rarotonga, and there are a few in the makatea forest of Mangaia. As its name implies, it is a unique tree of the Cook Islands, a 2-island endemic. Homalium has also been recently discovered on Rimatara in the Austral Islands and this might be the same species as ourMato. Trees have a single trunk, and shrubs have several main stems arising from the base. The Mato tree is unusual because it usually has a few trunks arising from the base – it is like a gigantic shrub. Where these trunks join there is often a cavity with water, which is an ideal breeding site for the day-biting Polynesian Mosquito (Aedes polynesiensis). The great hardness of Mato and the relatively small diameter of its trunks made it unpopular for timber – a feature that probably saved the native forest from early destruction by loggers. The flowers of the Mato are rarely seen, although a careful search usually reveals a few during summer. 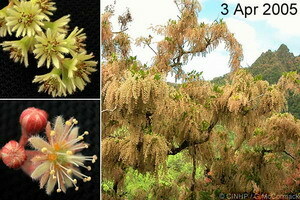 However, after a severe cyclone Mato flowers in extreme profusion, especially on branches that have lost their leaves. When the road was developed to the Tūpapa Water Intake there was a Mato tree pushed over by a bulldozer, which remained alive with a few roots in the ground. A few weeks later this half-dead tree flowered profusely. It is a feature of Mato that after a time of physical stress, as caused by severe wind (and an attacking bulldozer) they produce an abundance of flowers. The flowers develop rapidly and are soon shed with one small seed. The seed germinates quickly so the seedling can take advantage of the increased sunlight penetrating the forest floor after a cyclone. Mato is very conspicuous along ridges, as on the Avatiu side of the Cross-island Walk. The long and powerful surface-roots of Mato provide hikers with reliable footholds, but more importantly they literally hold the ridges together. Mato trees, which are rarely uprooted by even the severest cyclones, are very important in reducing soil erosion in the mountains. McCormack, Gerald (2005) Mato - Cyclones Make it Flower. Cook Islands Natural Heritage Trust, Rarotonga. Online at http://cookislands.bishopmuseum.org.